The opening fight of the night set the tone for the rest of the evening and any suggestions that these two fighters may have been nervous as the first bout of the night were quickly dispelled with Verbickas landing two solid body kicks early in the first round. Verbickas continued to work his opponent’s body with both kicks and punches and by the end of the first round Buttress had some ugly bruising on his ribs. The second round continued where the first left off with Verbickas dominating his opponent with repeated body kicks and some solid over-hand rights which clearly rocked Buttress. Buttress was eventually put down with a solid right hand to his body, but was quickly back to his feet and continued to come forward against an opponent who was beginning to getting the better of him. The third round saw Buttress come out strongly, obviously keen to seek some revenge for the punishment he had received in the first two rounds. However Verbickas responded with more solid body shots which had Buttress in trouble again. The unanimous decision in favour for Verbickas came as no surprise, his vicious body shots were compounded by some excellent and equally devastating body kicks which clearly hurt Buttress. Buttress put in a brave and spirited performance always looking to come forward, but ultimately he was overpowered by Verbickas. 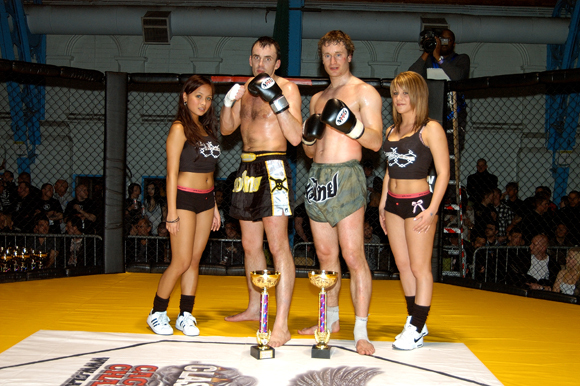 Both of these fighters were making their debut in the cage, but at very different stages in their lives. With a massive age difference of seventeen years it would prove to be an interesting contest between a more experienced and a more youthful fighter. From the first round it was clear that Dicken had a significant reach advantage over Andrews who struggled to find his range throughout the fight. Dicken landed some effective strikes and took Andrews to the ground using a leg trip from the clinch. With Andrews preventing Dicken from landing any effective strikes by locking his opponent down the referee stood the fighters up. Dicken ended the round by landing some solid leg kicks, Andrews would have needed to come out strongly in the second if he wanted to recover the fight. Andrews came out swinging, driving his taller opponent into the cage wall with the fighters moving in the clinch and exchanging some big shots. Dicken again took Andrews down, but failed to assert his advantage, resulting in the fighters being stood up. Dicken again took Andrews to the ground and began to get some more effective ground and pound going towards the end of the round. Dicken’s reach advantage and superior takedown ability proved too much for Andrews, but at just 18 Andrews certainly has a positive future having fought with a decent amount of aggression and determination against a very difficult opponent. A convincing win by Dicken. Andy ‘2 Fast, 2 Furious’ Crichton had prepared for this fight by doing extensive sparring with fighters significantly heavier than himself and this manifested itself in a new found knock out power, never seen before in his previous eight victories. Both fighters came out strongly, exchanging solid leg kicks and later in the round clinching and firing knees at one another, but it was in the second round that the fight really took off. Brook caught his opponent with some very strong uppercuts, testing the jaw of Crichton. A decent head kick by Brook was checked by Crichton, who then responded with a massive right hook which connected with Brook’s temple and sent him to the ground. The referee checked Brook out and found he was unable to continue. Crichton moves to an impressive 9 wins with just 1 loss, and can add a knock out to his previous decision wins. Butler was giving up a significant reach advantage to Palmer, but the shorter man was quick to remove this from the equation by taking the fight to the ground in the early stages. The first round saw Butler attempt a number of submissions and land some effective strikes on his opponent. The second round began with Palmer throwing a kick at Butler who checked it and quickly got a takedown. Once on the ground the local fighter, cheered on by a very vocal crowd, secured an impressive submission by side arm triangle after just 48 seconds of the second round. It was a pretty emphatic victory for Butler who showed that he could dictate the terms of the fight to suit his strengths and capitalise on his takedown ability to dominate his opponent. Chester started strongly getting a solid takedown, but Martin first pulled guard and then worked back up to his feet. Martin released a huge uppercut which cut Chester on his right eyebrow. Medics came in to stem the bleeding and after a fairly long pause allowed Chester to continue. Chester again looked for the takedown, but Martin managed to back him up against the cage and let a flurry of punches go, sending Chester down. 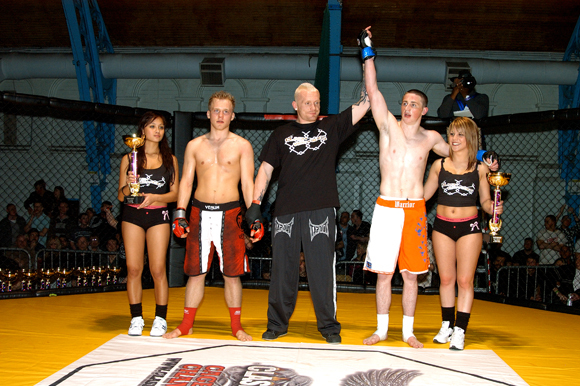 The referee stepped in and Martin got a decent win in his MMA amateur debut. This fight was highly anticipated before the start, with both men having a background in kickboxing an exciting stand up fight was expected. However the fight took a course which no one could have predicted. Konstandi came out and threw a massive right hand, which Coney easily evaded. However the force of the shot was such that it spun Konstandi both past and behind Coney. Konstandi finding himself with Coney’s back to him seized his opportunity and quickly dragged Coney to the floor whilst throwing a rear naked choke onto his adversary. The submission was in deep and Coney had no choice but to tap. The fight was stopped after a rather bizarre 11 seconds, a new record for Clash of Warriors. 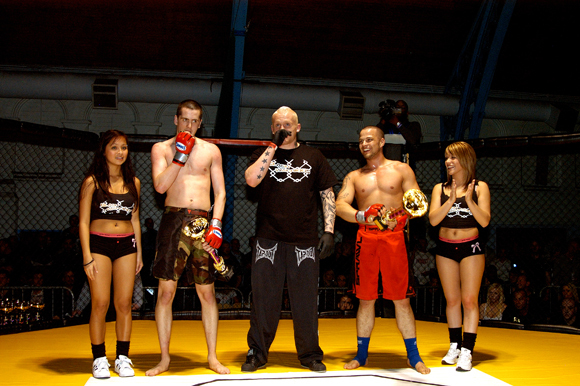 Whilst it certainly was not the fight that was expected, it must be recognised that Konstandi, a fighter well versed in Kickboxing, was technically good enough and aware enough to take advantage of a very unusual situation to utilise his submission skills and get his second MMA victory. The first ever female MMA fight for Clash of Warriors and the crowd received both fighters with a very vocal show of support. Whatever the view held on female fighting, no one could dispute the impressive level of technical ability shown by both fighters as the fight transitioned between stand up exchanges, clinch work and ground fighting. 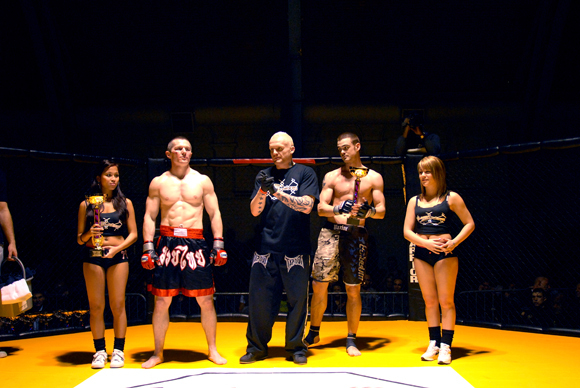 The first round was heavily dominated by both fighters tying one another up in a clinch and exchanging knees. Eventually Vagges got a takedown and worked hard to develop a ground and pound attack before finally moving to an arm bar which was successfully defended by Prichard. The second round saw Prichard come out swinging and securing a decent take down on Vagges. As Prichard moved to establish her own ground and pound Vagges skilfully manoeuvred an arm bar onto her opponent, forcing Prichard to tap. This was to prove to be a fast paced and exciting fight with Loughnane leading from the start. 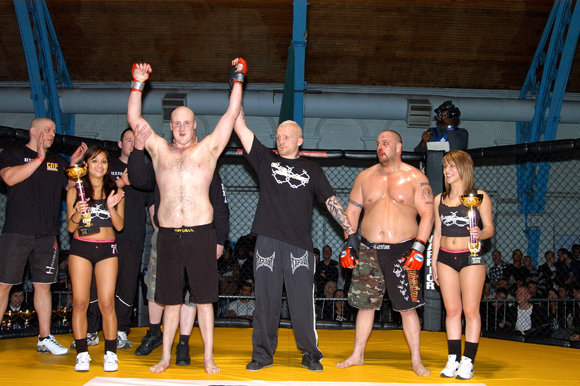 Loughnane quickly asserted his dominance with a combination of solid leg kicks and punches. The force of Loughnane’s shots sent Rose back into the cage wall, Loughnane quickly followed him landing a flurry of punches which put Rose down and in no state to continue. 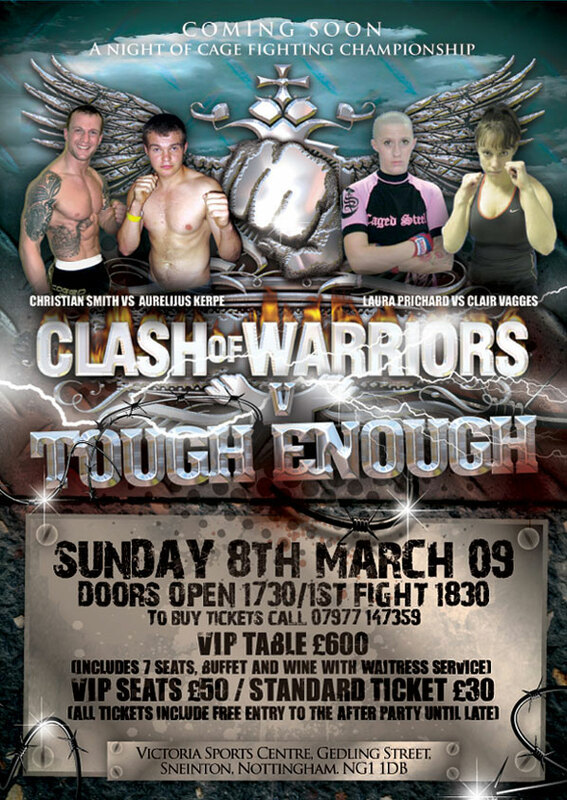 The large Manchester contingent in the crowd erupted in support of their fighter and Loughnane mounted the cage wall to bask in their applause. 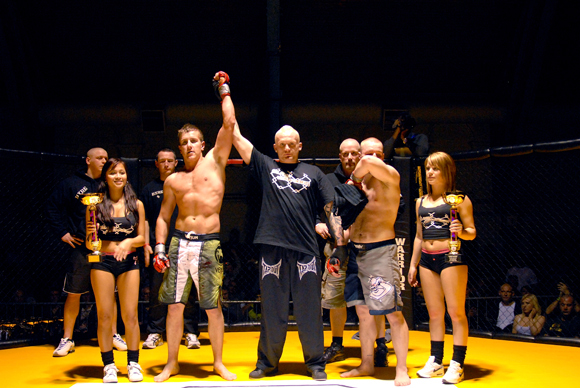 A very impressive second victory for Loughnane who showed some devastating striking power. Jack had described himself as a confident ground fighter before the fight and this proved to be the case with Jack dominating Johnson on the ground for the majority of both rounds. The fighters exchanged shots early on, but Jack quickly took Johnson down, Johnson managed to lock Jack down forcing the referee to stand the fighters back up. The fight quickly went back to the ground where Jack attempted both a rear naked choke and then an arm bar, both of which Johnson managed to defend. The second round was much the same of the first with Jack taking Johnson down, but failing to land much in the way of ground and pound or secure a definitive submission. Jack was clearly dominant, but will need to be more decisive in his ground game if he wants to progress in the sport. Ram asserted his dominance quickly in this fight, landing solid leg kicks from the start. Ram continued to press Brodacki who tried to back away from his more aggressive opponent. Ram took advantage of this by throwing a decent superman punch which connected sharply with the Poles nose and clearly rocked him. Ram stepped straight in and landed further punches which put Brodacki onto the mat where he quickly tapped indicating that he no longer wished to continue. Ram was far too strong and aggressive for his opponent and showed a good combination of stand up skills to totally overwhelm Brodacki. A well earned and definitive victory for Ram. This was a true heavyweight fight with two very big men really going to war in the cage. Taylor came out quickly, looking to draw Johnson into a brawl and both men exchanged heavy head shots.However Johnson seemed to have anticipated his opponent’s early aggression and repeatedly looked to clinch with Taylor and throw knees as Taylor tried to come forward. Johnson landed a decent leg kick which seemed to check Taylor’s advance slightly. Johnson tied Taylor up in a clinch and took the fight to the ground, where Johnson mounted and started to ground and pound until the referee correctly stepped in. Arish was quick to show his wrestling background by performing a textbook takedown on Huntley early in the first round. Arish remained in control for the rest of the round, but was not able to establish any effective ground and pound or secure a decent submission. 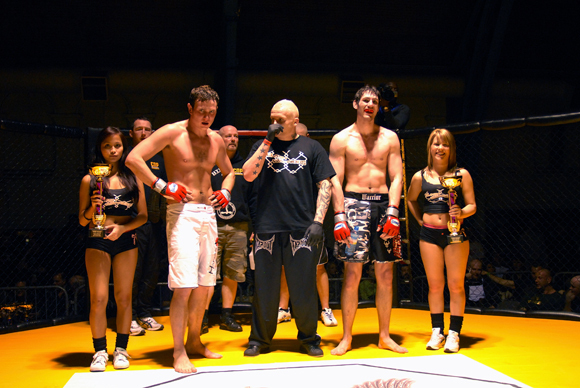 Huntley defended well and the round ended with neither fighter having inflicted any real damage on the other. The second round saw Arish take Huntley down again and dominate him further on the ground whilst still failing to land any convincing shots or appear to be able to submit Huntley. The third round was a virtual repeat of the second, although Huntley did show some decent stand up ability by landing a series of leg kicks. Arish spent much of the round in control of Huntley on the ground but again failed to inflict any real damage. Arish was clearly a very accomplished wrestler, but appeared to lack the requisite tools to take advantage of his ability to take his opponent down. Huntley showed some decent stand up skills, but Arish kept him on the ground for too long to really demonstrate this. 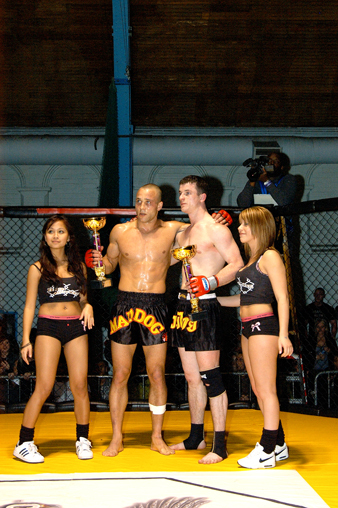 Jones showed his Muay Thai prowess from the beginning of this fight. He started very confidently, slamming leg kicks into his opponent’s front leg and then going for a huge head kick. Eventually it was a right hand by Jones that sent Malysevas to the floor and the Manchester fighter was quick to unleash some vicious ground and pound to force a stoppage early in the first round. Jones looked very impressive and clearly has a very strong Muay Thai arsenal which will cause any fighter problems. 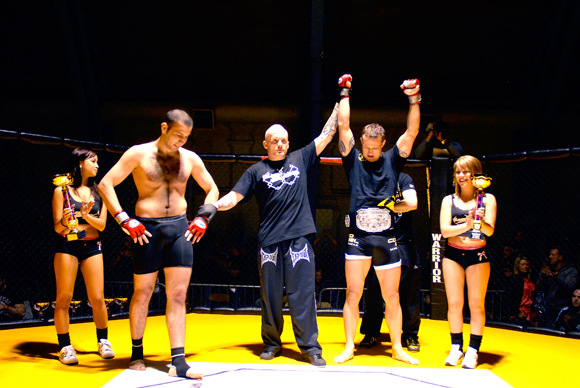 A very promising debut in what was not only his first MMA fight, but a MMA professional rules fight too. This had to be contender for fight of the night with an aggressive and fast paced fight that culminated in a superb technical knockout. The fight matched two conflicting styles against one another, with Waterfield well versed in wrestling whilst Cohoon was keen for a stand up fight. The first round saw Waterfield showing his wrestling ability with three successful takedowns, but Cohoon did well to limit the damage that Waterfield could inflict on him. 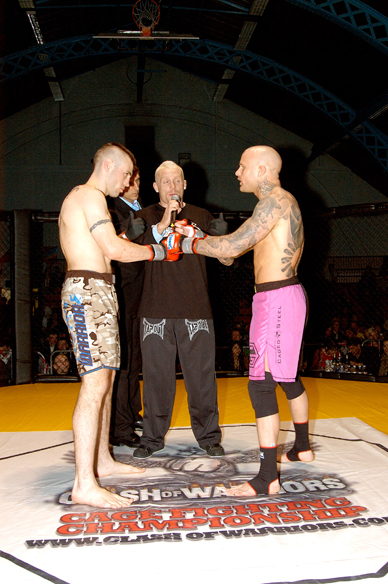 The second round saw Waterfield take Cohoon down again and both fighters reversed positions. After being stood up Cohoon decided to show off his own wrestling skills by taking Waterfield down, after being stood up again Waterfield landed some excellent shots which left Cohoon bloodied and seemingly facing defeat. Waterfield went for the shoot again, but Cohoon reacted brilliantly and landed a textbook knee to his opponent’s head, sending Waterfield to the ground. Cohoon followed in with some ground and pound and it was all over. An ecstatic Cohoon mounted the cage wall and the chant of ‘Cohoonie is a Psycho’ filled the hall. A spectacular finish to a great fight, with Cohoon pulling a victory out of what appeared to be a likely defeat. 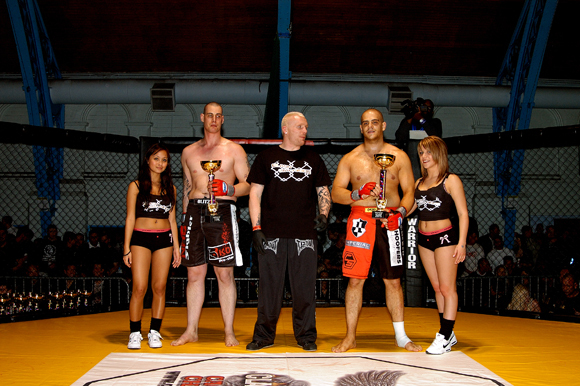 A very exciting fight between too excellent fighters who both showed an impressive range of MMA skills. 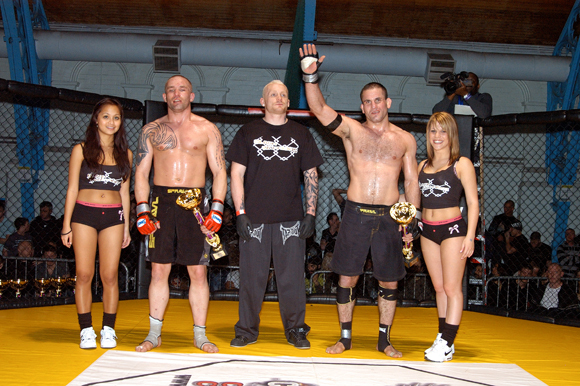 This was the first Middleweight Championship fight for Clash of Warriors and it did not disappoint. Smith started badly by taking a big overhand right from Jahongir which sent him straight to the floor. Smith reacted quickly though and tried to put an ankle lock onto his opponent and then used this to take Jahongir to the ground. Smith began some effective ground and pound and took Jahongir’s back. From there Smith worked his way to a rear naked choke and got the tap out, crowning him the Middleweight champion. It was a convincing display by Smith who turned an initially bad situation into a positive one and showed some very effective ground control.